Now that Pantone has announced The Colour of the Year for 2019, Illulian is pleased to unveil its exclusive Kaboom rug in the shade of Living Coral, “an animating and life-affirming coral hue with a golden undertone that energizes and enlivens with a softer edge”. The vibrant palette evokes comfort, positivity and effervescence at the same time. An ironic and charming rug knotted and carded by hand. Kaboom depicts a great explosion that recalls the action painting, a highly-charged, impulsive style of abstract gestural painting during which paint is energetically splashed, spilt or dribbled onto a canvas. The outcome? 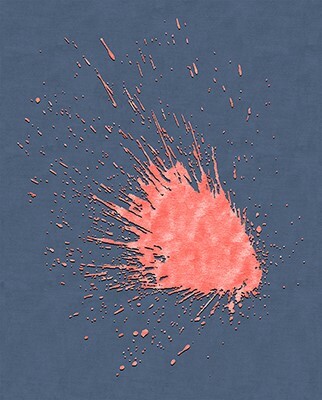 Not just a rug, but a veritable work of art: Kaboom is the distinctive, irreverent sign of a splash of colour, enhanced by the use of blue & living coral. Kaboom belongs to the Design Collection: Himalayan wool, pure silk and vegetable colours are the elements that contribute to giving the carpet a sophisticated appearance; soft chromatic details guarantee any environment an exclusive and elegant allure. The rug is customizable in terms of size and colour, in order to meet the specific needs of every international customer. All the rugs by Illulian are knotted and carded by hand and can be made in two quality levels: Platinum 120, the most exclusive line, is characterized by the use of top quality wool and silk and the extremely complex handcrafted process – with a stunning 180,000 knots/m2 – that creates highly scenographic sculpted effects. Gold 100 proposes rugs made from wool and silk, with a timeless charm and a density of 150,000 knots/m2. Price: starting from 450 euros per square metre exclusive of VAT. Quality: wool and silk (carded and knotted by hand). Measure: upon request (every dimension is available).